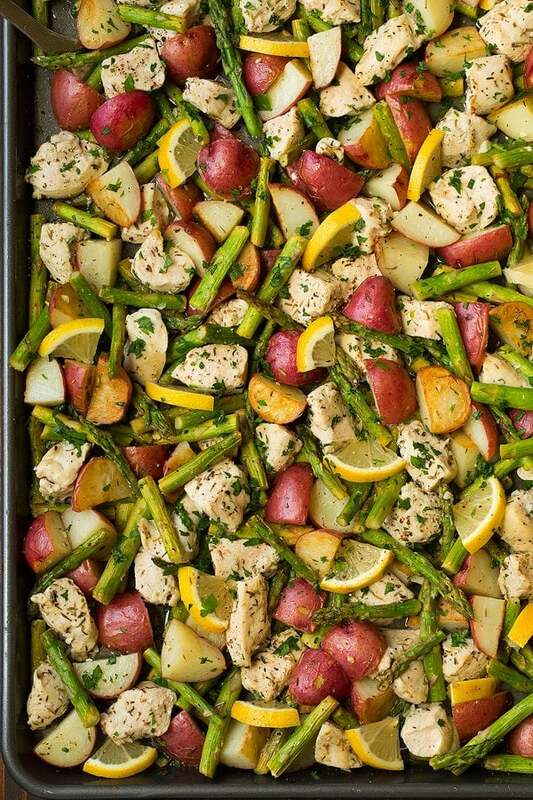 Lemon Chicken Asparagus and Potato Sheet Pan Dinner is so easy to throw together, it only takes about 15 minutes prep, most of which is just cutting, and the oven does the rest, and voila, you get a meal all in one! It’s healthy, hearty and satisfying, and it’s just purely delicious! The bright lemony flavor mixed with the herbs and garlic makes this simple chicken dinner taste like it’s not so simple. It’s pretty much an easy cheater meal, but hey what’s not to love? I’ve already made this sheet pan dinner two other times. 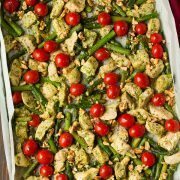 Each of those times I made this with green beans and I also added a little oregano which adds another herby flavor if you like that. This time around though I decided to go with asparagus because they roast up with a prettier tone of green – the green beans color just dies out. Both taste delicious though so if you’d like you can go with green beans since they are cheaper this time of year than the asparagus. One key here, like I mentioned with the other Sheet Pan Dinner I just posted, is to be sure to take the temperature of the chicken so you don’t overcook it. Chicken cooked past 165 dries out quickly so let’s not go there. Also work to keep the chicken pieces cut up the same size so they all cook evenly. You don’t want itty bitty pieces that cook up way before some big pieces may. I mean they definitely don’t need to be exact, just close. 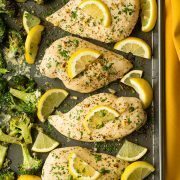 I’ve always loved lemon chicken and I just love how simple it is here, plus I love that I get my veggies cooked with it at the same time. 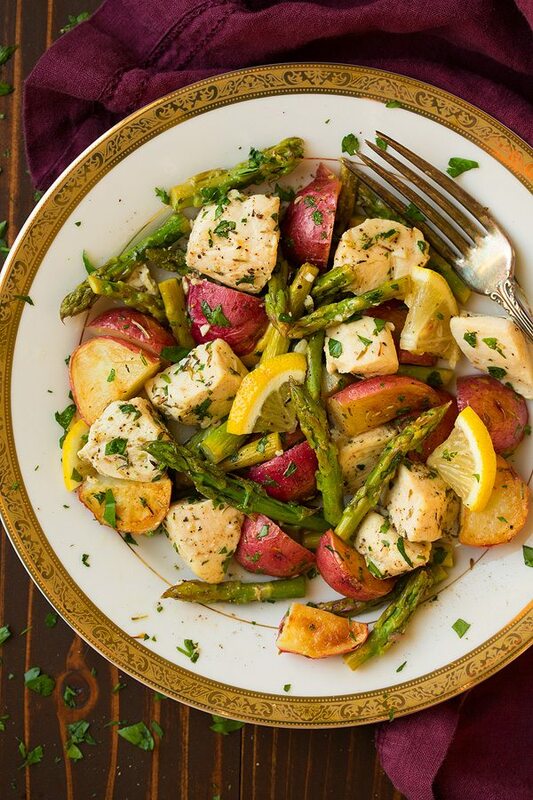 Try this meal, it’s tastes great and it’s something you can feel great about eating! This dinner is so easy to throw together, it only takes about 15 minutes prep and the oven does the rest. 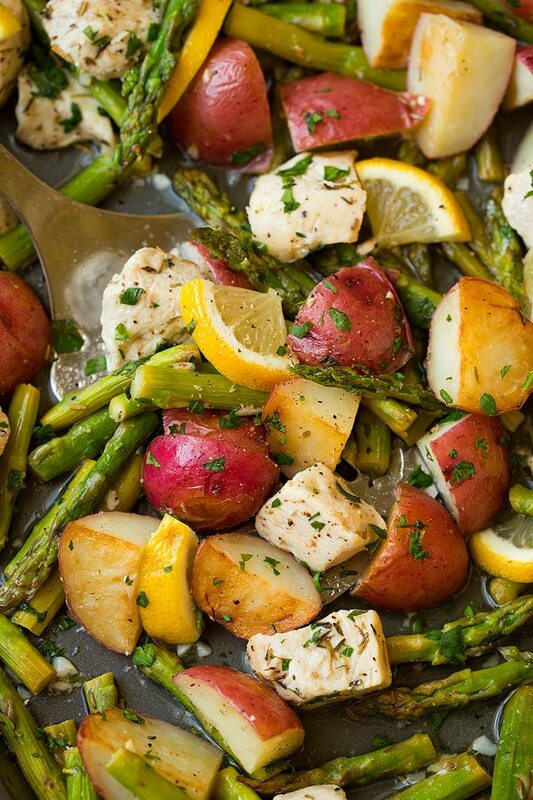 It's a healthy, hearty and satisfying one pan meal that's packed with fresh ingredients! The bright lemony flavor mixed with the herbs and garlic makes this simple chicken dinner taste perfect. Preheat oven to 400 degrees. Spray an 18 by 13-inch rimmed baking sheet with non-stick cooking spray. Place potatoes in a mound in center of baking sheet. Drizzle with 1 1/2 Tbsp of the olive oil then toss to evenly coat. Spread into an even layer then roast in preheated oven 20 minutes (meanwhile cut and prep other ingredients). 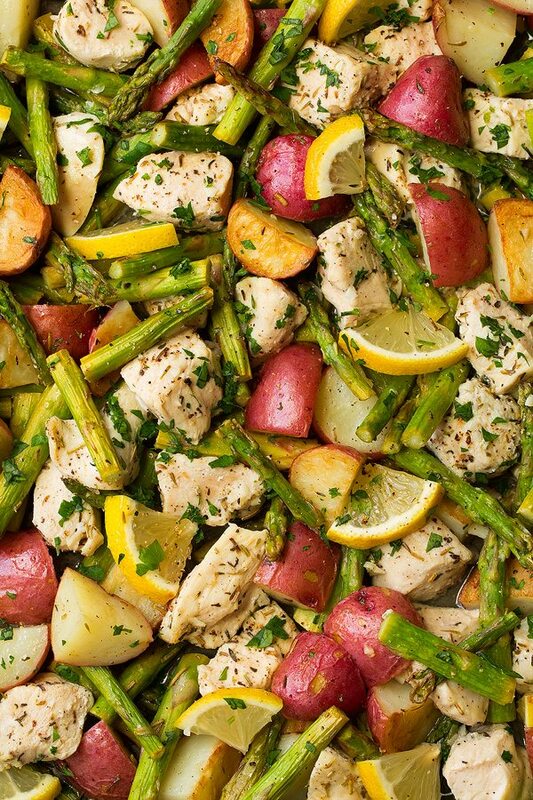 Remove baking sheet from oven, add asparagus over potatoes then chicken over asparagus. Drizzle remaining 2 1/2 Tbsp olive oil and lemon juice over the top. Sprinkle evenly with garlic, thyme, rosemary, 1 tsp salt and 1/2 tsp pepper. Toss (with a spatula, pan may be hot) to evenly coat, spread into an even layer (don't overlap chicken pieces). Return to oven and roast, tossing once halfway through, until chicken is cooked through (center should register 165 on thickest pieces), about 16 - 22 minutes longer. Season with more salt and pepper to taste, sprinkle with parsley and lemon zest and serve warm. 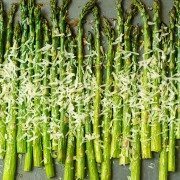 *If you don't want to buy two bunches 1 lb of asparagus would work fine too. 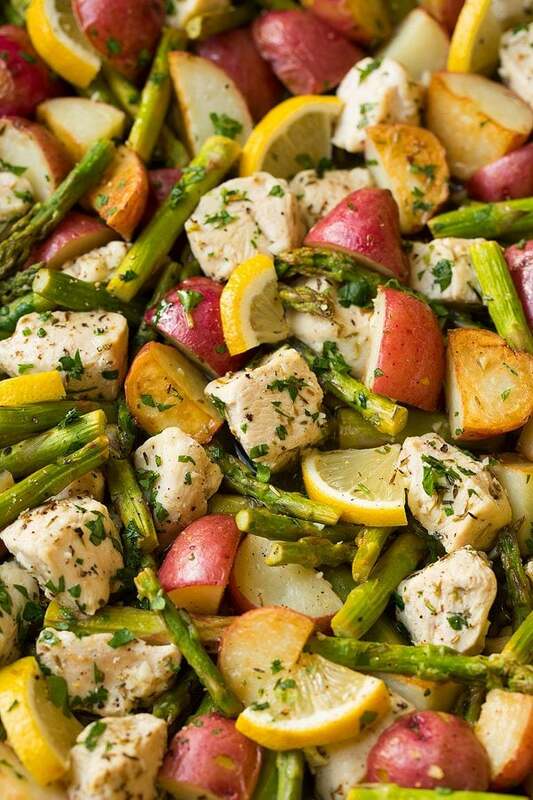 I've also made this with 12 oz of trimmed and chopped fresh green beans in place of the asparagus but I prefer to start them roasting with the potatoes so they aren't crunchy in the end, green beans take longer to cook than the asparagus does.